When it comes to receiving treatment for any medical condition, we have a lot more choices than we once did. We no longer are forced to go to the same physician our grandparents did, to receive the same treatment that may or may not work. One of the best things about medical treatment in this day and age is that we have options. Treating your allergies is no different. There are a lot of options, and it may be hard to decide. Traditional allergy treatments like shots and medications may not be helping you with your allergy symptoms. 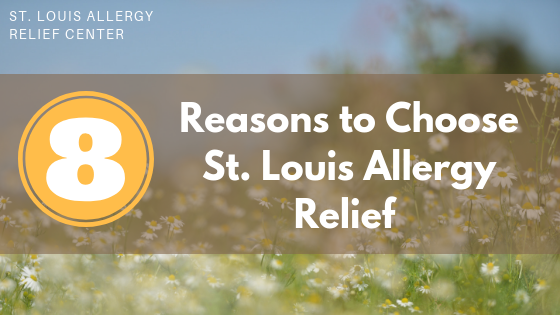 So we want to share why St. Louis Allergy Relief may be the best option for you and your family. Our treatments don’t stop at common seasonal and household allergies. We treat various symptoms including fatigue, skin irritation, respiratory issues, certain behavioral issues, substance allergies, and food sensitivities. The amount of sessions necessary and results seen may vary depending on each person. But typically our patients see a degree of relief from their symptoms in 1 to 3 sessions. Growing our knowledge of allergy relief and AAT is of the most importance to our team. We are continuously sharpening our skills with training and education to make sure we’re giving you the most advanced treatments from a knowledgeable staff. Making the shift to AAT treatments can be worrisome for new patients, especially after seeing medical doctors for so long. We will work with your medical doctors to ensure we’re getting the full scope of your medical history. We ensure you’re receiving the correct treatment for your specific conditions. AAT isn’t just what we’re good at, it’s what we’re passionate about. Our staff is eager and excited to treat you, and gives consistently friendly service to make you feel comfortable during every visit. When it comes to your allergy symptoms and treatments, no questions are off the table. We want to do our best to educate you completely on what we do and how it will help you. To find out more about St. Louis Allergy Relief Center and get started on your treatment journey, check out our Frequently Asked Questions, or contact us today.